More Facebook likes! This is the driving passion of some social media marketers. They desire it. They dream about it. They crave it. They somehow think that more Facebook likes is the panacea for all of the world’s ills. But is it that important? Apart from my obvious hyperbole, are more Facebook likes truly going to create massive engagement, viral excitement, and blast revenue to new heights of glory and awesomeness? We need to look at the data in order to find out if Facebook likes are all they’re cracked up to be. First, let me show you a bit of data that paints a rosy picture of the Facebook landscape. Does that paint a compelling picture or what? Shareaholic derived the data from more than a year of collection that involved 200,000 websites and an estimated audience exceeding 250,000 unique monthly visitors. Yes. That’s a lot of numbers. The biggest message of the chart is not Facebook’s referral metrics specifically, but on how it compares to other social media sites. As an early-comer, Facebook is obviously going to squash the competition. Referrals and likes are not correlated in this chart. Based on the data here, we have no idea how likes even play into the equation. Is there a correlation? Maybe, but it’s not evident. One of the most commonly-cited reasons why Facebook is important is its sheer size. At the time of writing, TheNextWeb reported that Facebook has 1.23 billion monthly active users (MAUs). That’s a lot of people. But what do Facebook’s MAU stats have to do with your participation in Facebook, let alone the like levels on your business page? Merely being a member of a vast universe like Facebook does not mean that you’re going to form a connection with everyone in that universe. So, let me share with you a few of the reasons why Facebook likes aren’t that big of a deal. Users who like your page may never engage with the content. Facebook users rack up likes like Michael Phelps collects gold medals. It’s easy for a Facebook user to like your page, but it’s far less likely that they will see the content you posted, let alone interact with it and visit your business Facebook page. According to a study cited by SocialSamosa, only 1% of users who like a business page will visit that brand’s Facebook page. Let’s apply that statistic to a hypothetical situation. Pretend that you acquire 1000 new likes to your business Facebook page! Once you sit down after your happy dance, you wait for the conversions to start rolling in, and revenue to start ramping up. What do those 1,000 new likers do? 990 of them don’t do anything. Ten of them visit your page. And what do they do on your page? Maybe click around a little bit. Then what? Facebook likes are not correlated with more business or more engagement. One social media analyst crunched the numbers of Facebook page “fans” vs. “talking about.” You can find out these numbers yourself by going to a business Facebook page and clicking on the number of fans. His goal was to determine if more fans automatically meant higher levels engagement. What he concluded was that the mere number of likes was only a facade. The real metric to pay attention to is not the number of likes, but the number of people “talking about this.” Engagement is more valuable than the off chance of a few impressions (“organic reach” in Facebook parlance). The good thing about engagement is that it’s free. You can engage with your fans without having to pay more to promote your posts. The real value of a Facebook community is not its actual size, but the value derived from engagement. Facebook likes don’t mean that you’ll get better quality business. Facebook fans have a limited possibility of bringing in more business. But if they do, there’s a question as to the quality of their clientele. Not all fans or likes are worth having, believe it or not. It’s easy to confuse quantity with quality, but as any ecommerce business person knows, the two are not the same. In the world of Facebook likes, one must be especially aware. Delete your Facebook page and get more fans? When Eat24 famously deleted their Facebook page, they axed 70,000 fans from their company’s digital presence. What did it do business? Business grew. The week that they killed the Facebook page, they decided it “was the best marketing move we made all year.” Besides making national headlines, they also saved all that money on wasted Facebook spending. Plus, according to Matthew Barby, they somehow experienced a 75% increase in app downloads. Experiment: The cost of acquiring a fan and promoting content just isn’t worth it. Matthew Barby explains how he shifted his Facebook strategy because of the failing impact of more likes. At one point, he was boosting engagement levels by allocating his Facebook budget towards acquiring new fans. New fans boosted engagement levels and brought in new conversions. I’ve found that once I bring in a new fan to my Facebook page, it’s becoming more and more difficult to reach them. Whilst they engage more than non-fans, I have to spend twice as much just to get my content in front of them in the first place. It begs the question: is the cost of acquiring a fan and getting them to engage less than the cost of getting a non-fan to engage? A year ago, the answer to this question was yes. In most cases now, that answer is no. It’s interesting to note that as Facebook’s stock has gone up, average organic reach levels have gone down. Does this indicate some nefarious scheme on the part of Facebook? No. It just tells us that Facebook basically stinks as an engagement channel. Engage, rather than build likes. While Facebook’s organic reach may have hit the bottom, you can still engage with your audience. The power of Facebook is no longer in its spread, but rather in the way that it provides a platform for interaction. Local pages have far more engagement potential than a standard business page. According to Authenticity Marketing, local pages have 5 times the reach, 8 times the engagement level, and 40 times the overall impact. The traditional Facebook fan page or business page has less of an overall impact than ever before. Thankfully, there’s still some juice left in the local page. Don’t use it Facebook as your primary audience. If you depend on Facebook or any social network as your primary audience, you’re making a mistake. To sum up that chart in seven words: Your organic reach on Facebook is tiny. Social Ogilvy’s study (see the chart above) analyzed more than 100 Facebook brand pages to measure their organic reach. These were big pages, and the total reach exceeded 48 million fans. How did these brands do pushing out their content? Not so hot. By February 2014, they were experiencing a 6% organic reach. And what about the little ol’ pages with less than 500,000 likes? A paltry 2.11%! Some of that organic reach may have simply have been seeing in your timeline that a friend (whom you hardly even know) liked a certain brand (that you hardly even care about!). That second-tier impression hardly qualifies as a reach! But maybe that doesn’t even matter because 2% is hardly enough to qualify as “reach,” either! Okay, so what about engagement? Maybe engagement is a better metric to track than organic reach? Or not. As mentioned previously in this article, engagement levels are low — often less than 0.1%! Nate Elliot of Forrester reports that the “top brands” on Facebook get .07% engagement rates. My biggest brand, KISSmetrics, has 19,000, give or take a few, Facebook likes. While that may look like a lot, it’s not anywhere near the half million required to boost my engagement levels upwards of 3%. Recognize that Facebook is valuable, but may have reached a saturation point. Facebook has had explosive growth ever since its inception, but the data shows that it may have reached its apex. 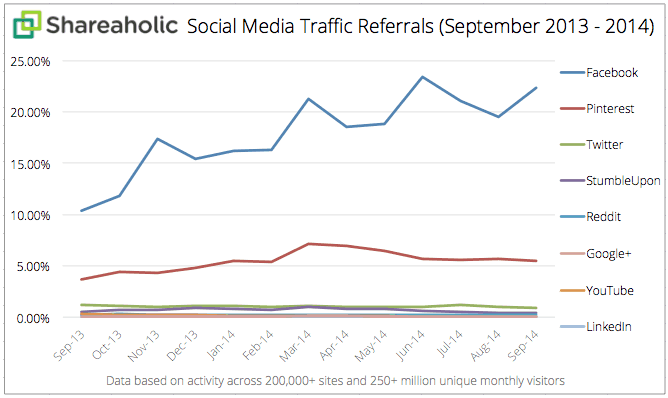 According to the Shareaholic numbers, Facebook’s referrals have slipped over the past few months. Don’t spend more money on it. Content and social experts have sunk a lot of cash into Facebook. What has it gotten them? They’ve gotten disappointment in return. Guess what came in dead last out of thirteen choices. Yep, Facebook. Hold it with a loose hand. Facebook has proved how unstable it is. Every social media platform has significant changes, of course. Facebook is so large, however, that the slightest tweak causes global reverberations. If you use Facebook, you can probably remember each one of these algorithm changes. Don’t depend on Facebook. Something may change again that will knock your organic reach even lower! Instead, consider ways that you could improve your reach without Facebook engagement, audience, and referrals. Sure, you should engage it for all its worth. But at the same time, be aware that things could change quickly. You need to be ready to adapt. I’m not here to discourage you from using Facebook. Stick with it. Stay on it. Do what you need to do. What I want to caution against is pursuing more Facebook likes. Likes themselves are fine, but they can be misleading. Is it worth spending that kind of money on a vanity metric? I’m not sure that it is. What do you think? Are more Facebook likes valuable?